This volume contains the results of a research carried out at the School of Social Sciences of the University of Genoa, which the authors of these works have contributed to. The collected contributions are related to the analysis of inequality and the indexes created to measure it. The term inequality identifies all differences in the level of well-being deriving mainly from differences in the levels of incomes, consumption, access to health care, education and life expectancy. Per-capita income is the measure of choice for economists to quantify inequality, although it represents only partially the well-being of a person. For example, even though inequality has increased in absolute terms in the course of history, it can not be said that the level of global health has declined, thanks to the reduction in child mortality, the increase in literacy and the rise of the welfare state. The measurement of income, despite its incompleteness, still remains an indicator able to show the historical evolution of inequality between people and countries history. Actually, there are many forms of inequality, and before discussing the concrete policies to reduce them, one must fully understand the many nuances of the concept. In order to do so, it is necessary to refer to both economic and social aspects, evaluating the interconnections between them. Only such an analysis allows to highlight an increasingly complex and detailed phenomenon. The modern science of society was prompted by the awareness that the social change associated with modernization defines new forms and contents of social inequality, where inequalities are not transmitted directly from one generation to the next one, but are rather produced or reproduced by market, or by state, civil society, family and community groups. Today's ever more globalized world has even exacerbate economic, social and cultural inequalities between individuals and between groups, particularly in the last three - four decades. Such an increase shows different characteristics in countries with different social and economic models. The disparities within populations are measured not only in terms of income and economic wealth, but also in terms of levels of education, culture, housing, employment and social relations, and availability and use of services. Inadequacies in these areas determine different degrees of deprivation, which we can measure by various indicators. 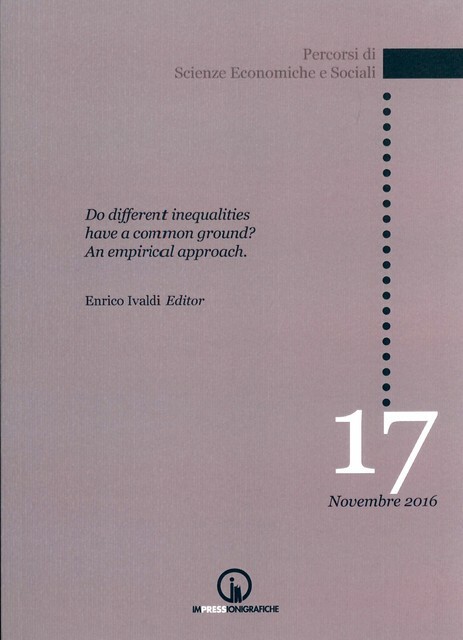 This work focuses on the analysis of various aspects of inequality in the Italian regions. The aspects considered are related to the analysis of: health differentials (1° chapter); gender inequality in education (2° chapter); difference in social and cultural participation (3° chapter). The volume is supplemented by two studies on material and social deprivation: chapter 4 refers to the different Italian regions, chapter 5 compares Italy and France.